Recognized as the industry’s first “green” mobile column lift, EARTHLIFT columns are made from components that are 98% recyclable, use bio-degradable oil, feature batteries that are 100% recyclable, and employ an Active Energy Retrieval System to deliver 35% more lifting cycles at maximum load. Lifting capacities range from 18,500 lbs. to 22,000 lbs. per column. Lifting capacity 18,500 lbs. 22,000 lbs. EARTHLIFT: A superior heavy duty lifting solution that is mobile, environmentally friendly, safe, fast and secure. 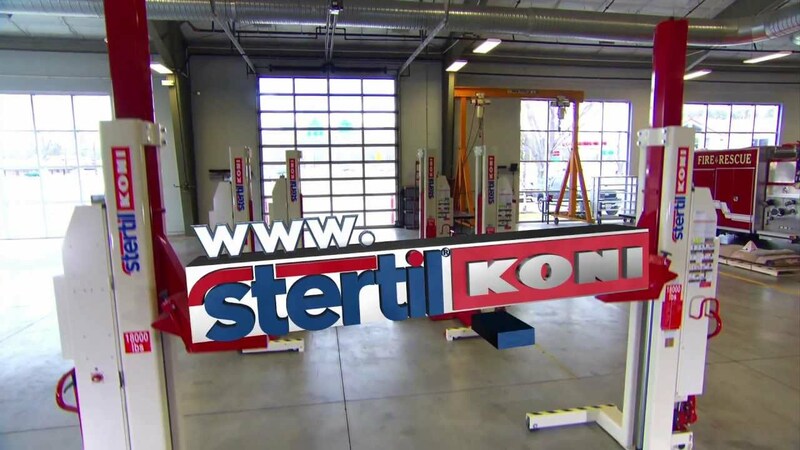 Combine the best in green lifting technology with the power and ease-of-use found in all Stertil-Koni lifting systems. Plus, enjoy the benefits of a full-color touch screen control console – the ebright Smart Control System – which comes as standard on the EARTHLIFT and delivers maximum information in real-time. Capture up to 50 lifting cycles without battery charging and optimize productivity in your workshop. The principle of the Active Energy Retrieval System (AERS) is as brilliant as it is simple: to use the energy generated by the raised vehicle as it comes back down. In other words: regain the gravitational energy. Both 18,500 or 22,000 lbs EARTHLIFT models are ideal for different situations. The 18,500 lbs EARTHLIFT model for example is ideal for super single tyres. For fleets or wokshops requiring extra lifting capacity, there is the 22,000 lbs EARTHLIFT model. The EARTHLIFT is the most environmentally-friendly wireless mobile column lift in the world. Totally cable-free, Stertil-Koni EARTHLIFT eliminates potentially expensive repair bills of damaged cables and offers ultimate safe working conditions as there are no tripping hazards caused by cabled over the workshop floor. The revolutionary ebright smart control system combines intuitive ease of use with maximum visual information about the lifting process. The 7” full colour high resolution touch screen is also operational when wearing gloves. With the user ID key, the user can configure the system to its personal needs.